The Prevention of Insults to National Honour Act, 1971 is backed by a rationale that no person has any right to insult the Indian National Flag and National Anthem. It is sad, however, to notice that while these representatives of our sovereign pride are duly protected by central legislation, the armed forces, comprising of the Indian Army, Indian Navy and Indian Air Force are left vulnerable to hateful/ derogatory remarks by our political elites. No other job in the country involves such harsh duty in extreme conditions on land, water, air, even underneath seas. Away from their families and devoid of privileges such as leave on festivals and weekends to convenientwork timings and work-leisure balance as enjoyed by civilians, armed forces personnel undeniably deserve at least a sense of respect for their tireless duty towards the service of the country and its citizens. The intent of the makers of the Constitution was clear, armed forces and such organizations discharge special duties and hence they cannot have absolute and unrestricted access to fundamental rights. The above Article restricts the powers and jurisdiction of the Supreme Court in matters related to armed forces of the country, a clear indication of the fact that the internal security of country and also its safety from external threat are special functions that should be differentiated from the civilian judicial apparatus. It is nothing but a perfect rejection and insult of these principles that the political elites of today never refrain from defaming the armed forces in public. Such denouncements are widely covered by the media and are debated in prime time slots, all to play with nationalistic sentiments of the general public. Politicians, cutting across political parties and ideologies, have resorted to bad mouthing the actions of armed forces to fetch petty political gains. While freedom of expression has explicitly been concluded as a basic right, it must be remembered in light of Article 33 of the Indian Constitution that the armed forces are a special service and they need differentiated treatment. 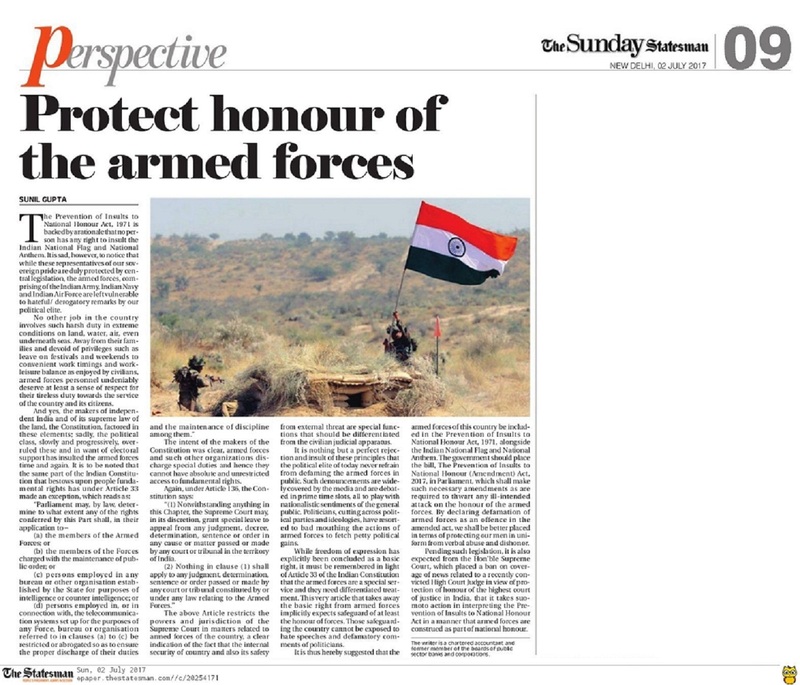 This very article that takes away the basic right from armed forces implicitly expects safeguard of at least the honour of forces. Those safeguarding the country cannot be exposed to hate speeches and defamatory comments of politicians. It is thus hereby suggested that the armed forces of this country be included in the Prevention of Insults to National Honour Act, 1971, alongside the Indian National Flag and National Anthem. The government should place the bill, The Prevention of Insults to National Honour (Amendment) Act, 2017, in Parliament, which shall make such necessary amendments as are required to thwart any ill-intended attack on the honour of the armed forces. By declaring defamation of armed forces as an offence in the amended act, we shall be better placed in terms of protecting our men in uniform from verbalabuse and dishonor. Pending such legislation, it is also expected from the Hon’ble Supreme Court, which placed a ban on coverage of news related to a recently convicted High Court Judge in view of protection of honour of the highest court of justice in India, that it takes suo-moto action in interpreting the Prevention of Insults to National Honour Actin a manner that armed forces areconstrued as part of national honour. Why is it that only non-BJP politicians condemn acts and actions of armed forces in the country? Only because they want to appease anti-India elements. It was so shameful than when a police officer was lynched in Jammu and Kashmir no opposition leader or separatists condemned the act with full force. Was he not an Indian citizen? Only Modi can bring such amendment to the Act. The opposition has made it a point to label BJP as anti-muslim and anti-freedom of expression party, which is false. Indian army has helped at all times of need, be it 1962, 1965, 1971 or 1999 or even during floods, earthquakes and tsunami. Political leaders criticising them should be locked up in jails. When we respect our national flag and national anthem then why not respect the true embodiment of our national honour, the army? All nationalists today do not want any discussion on misuse of power by ruling BJP, army and even cow vigilantes. This is a time of emergency in India. This is another way to silence any opposition to extra-judicial killings by army and misuse of AFSPA. If at all we are a free country with freedom of speech then even armed forces must be under this. True. Army personnel stay away from their homes for the protection of all citizens of India. They work under extreme conditions. By blaming them we only bring down their morale. I agree that army, navy, airforce and even central armed police forces must be included in National Honour Act so that all those who criticise their actions should be brought to book. Why only an offence, why not sedition? Army protects us from terrorism, at times of natural calamities hence they at least deserve some respect from all civilians.